The American Hereford Association (AHA) continues to leverage the breed’s strengths to meet the needs of every component of the beef supply chain. 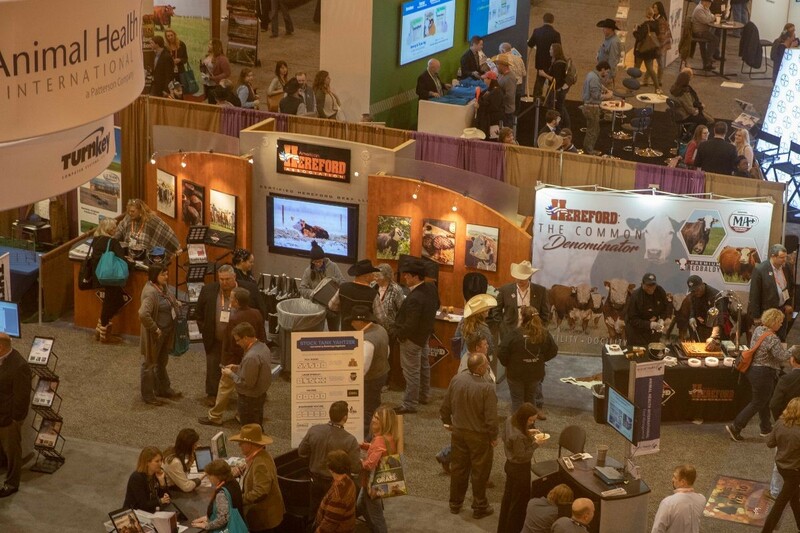 AHA team members shared the proactive efforts the Association is taking to position the breed in the marketplace at a media briefing held Jan. 31 during the 2019 Cattle Industry Convention and National Cattlemen’s Beef Association (NCBA) Trade Show in New Orleans. At that briefing, Shane Bedwell, AHA chief operating officer and director of breed improvement, remarked on the association’s recent work to advance the genetic merit of the breed, in recognition of the need for high-quality cattle in the marketplace. He spoke with Radio Oklahoma Ag Network Associate Farm Director Carson Horn to expound on some of the points he highlighted during the briefing. You can listen to that complete interview by clicking or tapping the LISTEN BAR below at the bottom of the page. Last year, the AHA overhauled its genetic evaluation system, implementing a single-step marker effects model utilizing BOLT technology, which simultaneously analyzes pedigrees, phenotypes and genotypes and allows for a fully automated, weekly genetic evaluation. According to Bedwell, the overhaul has been equipped with a genomic pipeline to provide quality control of the 70,000 genotypes entering the evaluation. Another change to the genetic evaluation, Bedwell reported, was the adoption of the North American Hereford Genetic Evaluation, which merges data from the AHA and the Canadian Hereford Association. All data are totally supported by the AHA Whole Herd Total Performance Records (TPRTM) program, ensuring an unbiased data set. “Our breeders are getting the most up-to-date, relevant information to make the most informed decisions possible,” Bedwell said. In collaboration with Neogen® and Allflex®, the AHA also launched the Whole Herd DNA Cow Herd project in 2018 to incorporate more female genotypes into the updated genetic evaluation. Nearly 10,000 genotypes were collected through the project and Bedwell indicates plans are underway to incorporate the recently introduced Sustained Cow Fertility (SCF) trait, as well as other maternal traits, into the marker effects model. In addition, the National Reference Sire Program (NRSP) continues to grow and add value to Hereford genetics. The NRSP allows for unbiased, third-party data from large contemporary groups and supplies the majority of the economically relevant traits to the AHA’s genetic evaluation. Last year, more than 3,500 females were exposed to Hereford bulls through the program. There are seven test herds located throughout the U.S., three of which were added in 2018. Since inception, the program has tested 375 sires for progeny data from birth to harvest, and last year’s data highlighted the progress the breed has made in terms of marbling and feed conversion. Due to this focus and dedication to breed improvement, the Certified Hereford Beef program has seen a nearly twofold increase since the establishment of the Certified Hereford Beef brand in 1995 with 80 percent of CAB qualifying carcasses grading at Choice or higher. Listen to Bedwell talk more about the AHA's recent efforts in breed improvement with Horn, tap below.